Home » Lev’s Log » Lev’s Log: Confessions of a trail dumb downer. 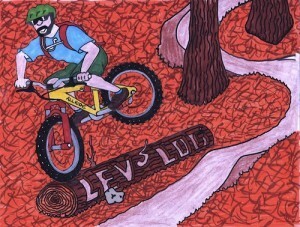 Lev’s Log: Confessions of a trail dumb downer. That rock that you would always pedal-strike, I made it smoother. That ditch you could almost wheelie across, I filled it in so now you can roll it. That tight switchback that you could hop around like Ryan Leach and all your friends were impressed, I made it so you can pedal around it. I have a confession: I am the guy who dumbs down your trails. Over many years and miles of trail work, I have smoothed, buffed, filled in gap jumps, opened up corners, bench-cut narrow trails, dismantled wooden features, made mandatory drops rollable, armored stutter bumpy corners, cut out roots, rerouted trail, and I apologize for none of it. 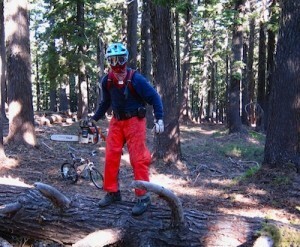 I continued building trails without permission over the years in California and in Central Oregon, when I moved here. The theme was always steep and technical, usually as much fall line as possible. Eventually, I joined my local trail association because I decided I could put my efforts to better use by cooperating with the authorities to develop legal, land owner approved trails. Now, I am a trail crew leader, designer and head builder with Central Oregon Trail Alliance in Bend. My main focus is the more technical trails we build and maintain. I have also adopted two trails and have added a lot of my personal flair to both. Ever ridden South Fork or Whoops? Those are my babies. Who else is a trail dumb downer? Folks who have been working on trails for a long, long time. Guys like me who do trail work all the time don’t want to come back to the same problem on a trail over and over. We have learned to approach trail sections with a five or even ten-year plan to make our efforts sustainable. A trail dumb downer may be working with local land management to develop better trail systems in your area, and the scratched in track out your back door is becoming the “Blue Square” route. Trails close to town should be the easier trails, with the more technical advanced trail further out and harder to find. I am calling out anyone who whines publicly about losing the one technical feature on their favorite local loop for being shortsighted. Before getting all indignant, consider the history of the trail, why it’s there, who built it, was it built to be mountain bike specific or is it an old hiking trail that we now ride? However the trail started, degradation happens over time; and needs upkeep. Often times the big rut or erosion problem ends up being the most technical part of the trail. Case in point: There is an MTBR thread questioning some work I did on a trail that is many locals favorite downhill. It has fast rooty sections, hard loose corners and rough straights that require advanced mountain bike skill to ride well. However, this trail did not start out rowdy or chundery. When built in the 1980s it started out as smooth, loamy hiking trail. After being rolled over by thousands of knobby tires and 30 years of rainstorms and snow melt, the roots became more and more exposed and yes, more technical and more fun. To make it more sustainable, the most eroded sections need fixing and armoring. Yes, adding flat rock and covering the roots dumbed down the trail, but what it accomplished is a piece of trail that will hopefully last 10 more years. 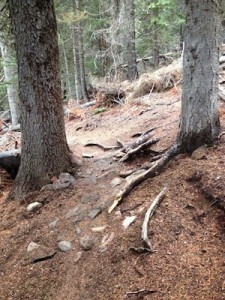 Here is the Forum post, http://forums.mtbr.com/oregon/more-dumbing-down-bend-trails-938030.html. I still want to ride steep, techy trails like the ones that scared me on that unnamed campus as a kid, and I know where to find them. They are not the after-work ripper loop that you bust out of from your house or the two-mile loop out of your local trail center. You must make an effort to ride these trails, go beyond guidebook or online reviews to find these trails. The trails that are on the maps and in guidebooks, have an established trail head and have a trail rating, and need a bit of homogenizing to serve the masses. There is no preserving a trail. What you experience today, this week or even this year is just a snapshot in time. The trail will change; plants encroach on it, rocks and trees fall and the trail shifts in response, heavy rains erode the surface exposing roots, rocks and forming ruts. The maintenance done usually makes the trail easier, by default. But don’t worry; soon enough, the trail will change again. Is this an issue in your area? What do you think of the work done to your local trails? Are you a trail dumb downer too? What are your reasons to make a difficult section more rideable? Have your trails been dumbed? What do you think of the changes? This entry was posted in Lev’s Log. Bookmark the permalink. Spoken like a true brother in arms. One rider’s obstacle is another rider’s feature. I’m a builder for Boulder County Parks and Open Space in Colorado. 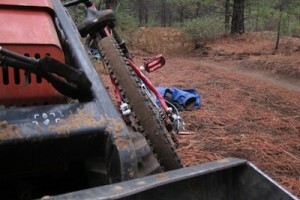 We have four main properties that are considered our top mtn bike trail systems. They each get 75k worth of use per year by all users. However, Parks and Open Space was really created to just be Open Space with little in house support for trails…until the public starts to raise a stink . We have a mandate of “passive recreation” meaning no trails built for any one user group, but when 90% of users are mtn bikers…there’s a problem. Most of these properties have one trail to service the trailhead and then branch farther out. That means the bulk of users are engaging in two-way traffic for extended periods of time. Conflict is not a huge issue thanks to education efforts by our local MTB club, but it seethes underneath the surface. Hikers hate mtn bikers (since the dawn of time) and mtn bikers get annoyed having to yield to other riders just as they’re getting their flow on. Everyone gets a little frustrated. For my trails (yes, MY trails) the point of contention with the mtn bike community is also dumbing down. With so few trails, the “bros” want EVERY trail to be a black diamond experience of rocks, logs, and roots and the “gumbys” want polished veneer tread. What makes it worse is that we have no difficulty rating system and few trails of varying difficulty on any one property to allow people to self select the trail experience they want. Add to that horses and hikers who still need to have a trail that works for their slower speeds and mode of travel–big berms and rollers seem odd as you’re just walking along. I am constantly getting dressed down, even by my own riding buddies, about keeping trails “as they are”, which as you so brilliantly pointed out, never stay that way–even when “fixed”. Ultimately as trail builders we have a duty to protect the land first and then find ways to make the trail experience fun and unique for all users. I think it’s important, just as you stated, to look at all users on a specific system and try to fit the trail to how it’s being used. Being able to rate trails on difficulty gives a trail builder way more latitude in building–using flat, flagstone armoring on a green trail vs uneven stone with tight gateways on a blue/black for instance. Keeping that green trail nice and wide and predictable vs choking down those blue and black trails and keeping more features in the trail tread—keeping in mind that no one is policing the trails and that humans are still sheep and ALWAYS follow the easiest line through technical terrain, despite their rants to the contrary on MTBr. Some trails need to be somewhat predictable for the gapers and gumbys that are there to skid, avoid trail features, and otherwise try to tear down your treehouse. That means taking out the sharp corners, covering roots, and adding more flagstone-style armoring. Again, like you said, we can’t keep coming back to the same problems over and over. And with the number of riders on our system, those problems can reestablish themselves in a short time. Predictability = sustainability for the long haul. Keep up the fight! And remember, creativity is one of the big reasons we’re in this game. It’s up to us to find the solutions that work for all users–bros and gumbys alike. I get armoring roots, it keeps us from damaging the roots of trees, and subsequently killing those trees. What I don’t understand is why go through the effort to reenforce something while taking away the fun of technical steering? If it’s easy to armor out a root system(getting those rocks there is not so easy, I understand this), why not use rocks that will reshape the technical aspect of the repair, but not take away from the technical aspect of the section? What I’m trying to say is, armor out the roots to protect the trees, but when doing so, use the rocks collected to reshape the technical aspect of the section, and not just smooth it over because that is easier and less work; which I believe is considered “dumbing-down”? I too have done trail work, however, none of it has been legal(though I’ve stopped that some years ago as I now want to join NWTA), and I absolutely saw the need to protect every tree I was getting near, so I armored the roots with rock, but would arrange the rock so that the technical aspect is now rock, not root, but the repaired/maintained section does not lose its high skill rating. Big ups for South Fork. We would’ve moved away if that trail didn’t exist 🙂 Thanks for making it great. My husband (avid advanced MTB rider) and I (ultrarunner) have this discussion about trails in Central Oregon daily with the knowlege that there are reasons for the texture of the trails that we don’t have insight into. You all do an incredible job with the terrain that you have to work with. Here’s the “BUT.” Coming from North Lake Tahoe in search of a more balanced life in Bend, we miss the rugged Sierras. Bend is such a rad place with great organizations like COTA that we are lucky to have. I am not bagging on Bend. We chose to be here over anywhere else in the country even with more cross – country terrain than we could care to use. There are illegal trails that we miss in the Sierras and we’ve searched high and low for them here. Any tips? PM: katelevi@gmail.com I literally googled, “illegal trails Central Oregon” and found this thread. Please no haters telling me to go back to California. Again, I have a ton to be grateful for in Central Oregon and I know it. It really was a tough choice not to pick an overpriced mountain town with burly terrain.